Okay Australia. Let’s talk about tax. I know it’s not the most exciting topic, but the past week has revealed an epidemic of economic illiteracy that has been frustrating to watch. “I’ve got a disability and a low education, that means I’ve spent my whole life working for minimum wage. You’re gonna lift the tax-free threshold for rich people. Of course it’s natural to empathise with Duncan, a man who only wants what is best for his daughters and who clearly works hard to provide for them. However, the avalanche of commentary treating Duncan as a symbol through which to critique the government’s so-called tax cuts to high income earners is over the top and misleading. Sure, it feels good and it’s popular to complain about the rich and accuse them of riding on the shoulders of the poor working man, but is there any truth to this myth that gains so much traction? Only 1% of the population earn over $265,000 a year, yet they pay 17% of tax. 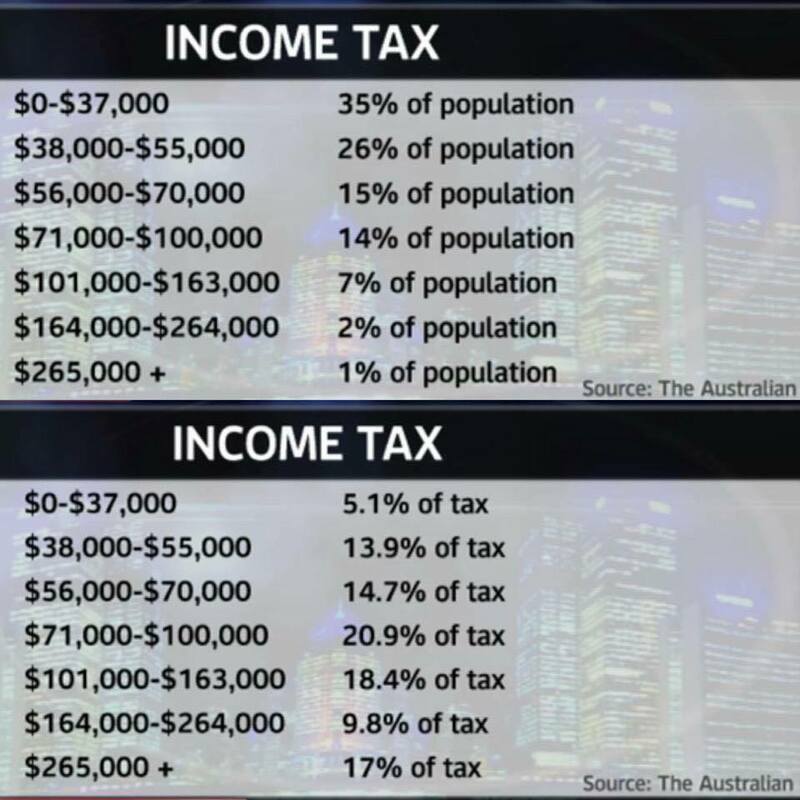 2% earn between $164,000-$264,000, yet they pay 9.8% of tax. That means that 3% of taxpayers are paying 26.8% of the total income tax in Australia. 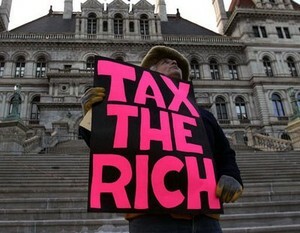 If we factor in the next tier, the 7% on $101,000-$163,000 paying 18.4% of tax, then the harsh truth really kicks in. 10% of taxpayers are paying for 45.2% of income tax in this country. So why do they get a tax cut and men like Duncan don’t? The answer: they’re paying enough tax already! They’re paying for the majority of our social security, our health, our defense. In fact, according to Australian Bureau of Statistics data, the average Australian household received $2.70 in cash and services for every $1 it paid in tax. The same data reveals that taking into account social security payments, welfare, public education and public health, only 20 percent of households pay any net tax – the other 80 percent receive their tax back via a range of social programs mentioned (this is also taking into account GST payments). The Australian has already revealed that Duncan actually pays no net-tax once Aus-Study payments are taken into account. Instead of grasping this reality and acknowledging the role the rich play in funding our lifestyles, Australians have embarked on a campaign of selective ignorance. It’s easier to throw mud at the rich and support the battler than engage in reality. This is dangerous. The Labor Party is cunningly tapping into the fallacy, running advertisements exposing the government’s apparent tax cut towards high income earners. What’s left out of the ad is the fact that the top income earners are receiving a promised 1% cut after the top marginal rate was temporarily increased to help service the country’s spiraling debt. One can understand why Labor would be unwilling to talk about this fact, since they are largely responsible for the $12 Billion in interest payments we fork out to service our now $300 Million debt. 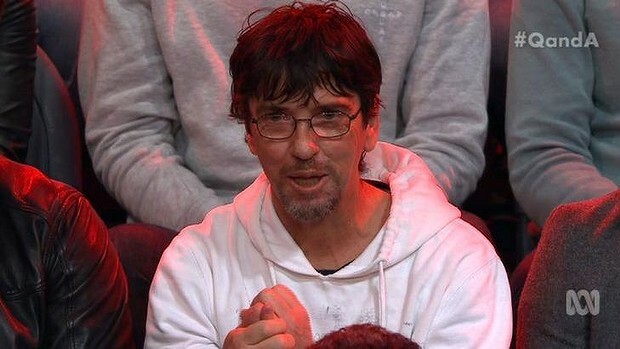 A debt with Labor’s imprimatur on it. Unfortunately, the rich vs. poor debate is too often conducted on the basis of simplistic falsehoods. These untruths need to be challenged, or we’re all poorer. The facts aren’t popular, but they need to be clear. Otherwise we descend into the mire of class-warfare against a class that did nothing but fund the majority of our lifestyle. Yet due to our unprecedented sense of entitlement, this class won’t be expecting a thank-you anytime soon. Good Morning Mr Hughes, your publications as always are well measured and insightful. I would personally like to thank those hard working Australians who are building our future. I believe that Malcolm Turnbull and the Liberal Party has a plan for a strong new economy that will create new, higher paying jobs for the 21st century. Labour on the other hand does not. The have no plan and further to this they just want to raise taxes, that will hurt Australian families so that they can continue to fund their corrupt union heads. On July 2nd Australians will have a clear choice, to vote for Liberal, is a vote for a strong economic furture, a vote for Labour, is a vote for failure. Yes OK, you have the figures (if correct). I am not sure you consider the incidence of reducing income (taxing) a person in the lower fringe as compared to the same in the higher fringe. For the “poor” a dollar + or – MAKES a difference. For the “rich” not so, because they still have the option of reducing their standard of living. This situation is similar to that of legal representation: the poor cannot challenge a traffic fine. The rich can buy legal immunity. It is true that higher earners pay more tax. Nobody is arguing with this. People are simply asking whether someone who has over $200,000 a year to play with really needs a few extra bucks or whether there are others who would get more from the same money. It’s useless to stand outside of context and talk dollar amounts as if all dollars were the same. They’re not. Once you have enough of them to meet the cost of living every extra dollar can be used for entertainment or exercising personal choice. Which is nice but doesn’t mean the same as that same dollar would to someone who can’t meet living costs. I also found your use of the word “lifestyle” egregious. Trying to meet living costs, gain a basic education, or seek medical treatment is not a “lifestyle”. You’re demonstrating an ignorance of the reality of life for many people by tossing out these sorts of inappropriate terms. There is a whole industry out there in the real world who produce absolutely nothing – except schemes for the rich to avoid tax. How is it achieved? By lowering the taxable income, which is presumably the basis of the tables cited hereabouts. What is the percentage of those fine Australians who wriggled down the taxable income scale to below the magic $265k. Perhaps the top 2 brackets shown here should be paying significantly more. The average mug in the street cannot avoid paying his fair share – the top end of town uses tax avoidance as a sport of choice. That fact is with liberal taxing rich do pay less and the poor give more , so why shouldn’t the rich pay more tax ? Furrealz? That’s maorulvesly good to know.